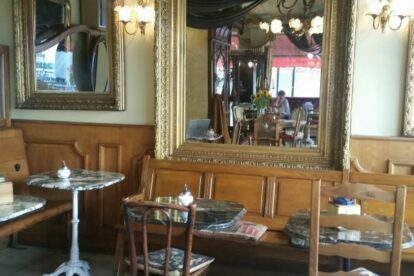 La Vouivre is one of the most charming cafes I know in Geneva. It is not the one I go to the most, but it’s the one I prefer to go to. I like looking at all the details of the decoration with antique furniture and marble tables. No items are alike, from the odd tea sets to the coffee mills collection. The highlight of this tea room is of course Sean Connery’s portrait in a gilded frame hung in the middle of a huge mirror behind the counter! Sean is inviting us to try all the delicious and homemade sandwiches and pies. So let’s try them, it would be silly to not follow Bond’s advice, wouldn’t it?! Moreover, the price is not expensive.You order at the counter and they bring you your order. La Vouivre is the perfect place for a cozy breakfast, the tartines and pains au chocolat are excellent, as well as the coffee and the ginger tea. Offline Geneva tips? Get our iPhone / Android app!